Nachos are one of the most popular snacks in the United States and Mexico, no wonder they have their own holiday. The National Nachos Day is celebrated every year on November 6. Just like many other popular dishes, nachos were invented accidentally. Circa 1943, several wifes of U.S. soldiers arrived at the restaurant in Piedras Negras, Coahuila, Mexico. The restaurant had already closed for the day, nevertheless the maître d'hôtel, Ignacio “Nacho” Anaya, agreed to serve them. He didn't have much ingredients available in the kitchen, so he cut tortillas into triangles, added some shredded cheese, heated them, and garnished with sliced pickled jalapeños. He called the dish “Nacho's especiales”. In the course of time tortilla chips became simply nachos. Very soon nachos became popular in Texas and the rest of the American South and Southwest. The traditional nachos are tortilla chips covered with cheese or cheese-based sauce. 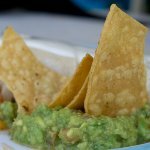 They can be served with a variety of toppings such as salsa, guacamole, sour cream, hot sauce, ground or sliced meat, beans, chili con carne. Nachos served with many toppings are sometimes referred to as “super nachos” or “loaded nachos”. To celebrate the National Nachos Day, throw a party with loads of nachos and ask your guests to bring their favorite toppings.